Graham is joined by The Crown star Claire Foy. 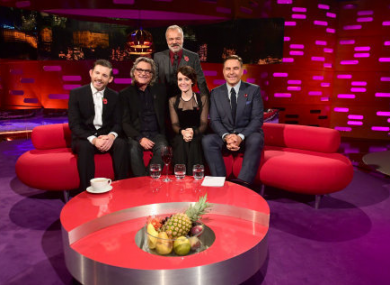 Kurt Russell is also on to discuss his role as Santa Claus in The Christmas Chronicles, and of course, David Walliams is on because he’s contractually obliged to be on TV at least once a day. Lee Evans and Mumford and Sons also appear. Former president Mary Robinson will be on the show tonight, along with failed presidential candidate Peter Casey. Boxer Andy Lee will also be discussing his new book with Ryan, and new Dancing With the Stars Ireland host Jennifer Zamparelli will be making an appearance. Music is from The Blizzards and Phil Coulter. An ex cop is hired by a drug trafficker to find the men who murdered his wife. As he begins to investigate, he finds that the men may have killed more people than he originally thought. It becomes a race to stop them before another they claim another victim. Liam Neeson stars. This Irish documentary about the Irish marriage referendum is now on Netflix. Produced by COCO Television, it tells the story of the people who formed the Yes Equality wave in Ireland leading up to the May vote back in 2015. I Love Trouble (RTE, 11.50pm) Julia Roberts stars in this rom com mystery about two journalists who have to join forces after trying to outscoop each other. Gogglebox (Channel 4, 10pm) If you need something to tide you over until the Irish one is back. The GBBO An Extra Slice (Channel 4, 9pm) Interviews and laughs with the competition’s winner. Dark Heart (Virgin Media One, 9pm) The crime drama continues.